First of all, I don’t like pitch black darkness. I get claustrophobic. Second, when I’m sleeping in a tent in the wilderness, I do like to be warm. Third, I don’t like sleeping in a tent. Period. I’d rather have my sleeping bag under the stars, with no skin between me and the sky. Actually, I don’t even like sleeping on the ground. My 54-year-old bones and joints ache too much. Can’t get comfortable even in most beds, which is why at home I sleep in my recliner. 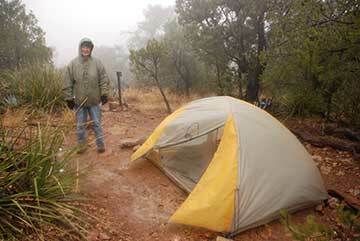 I bought an air mattress especially for this trip, which I took with my son Ryan into the high Chisos Mountains. While it did keep me warmer than my old foam pad, it was not comfortable. So now that you’ve got the background as to why this was the Worst Night of My Life, I’ll tell you about the trip. 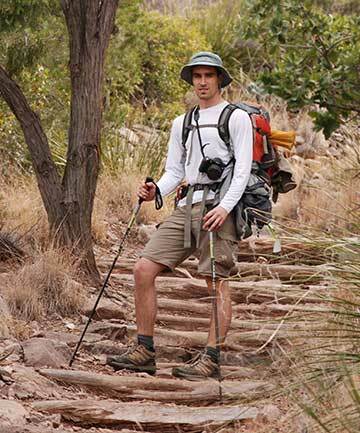 My 25-year-old son Ryan is a veteran backpacker, thanks to being hauled into the wilderness by me and his dad since he was 6 months old. During his visit from Seattle two weeks ago, I wanted to experience with him the high Chisos trails, and to see the glorious sunrises and sunsets from the South Rim here at Big Bend National Park. Working around my duty schedule, we chose two nights and three days for a backpack trip. First night at Toll Mt. 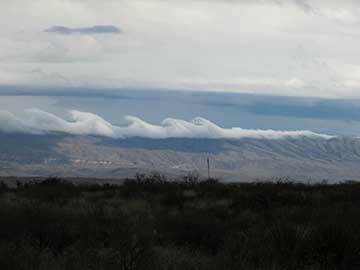 near Emory Peak. Second night at SW4 on the South Rim. 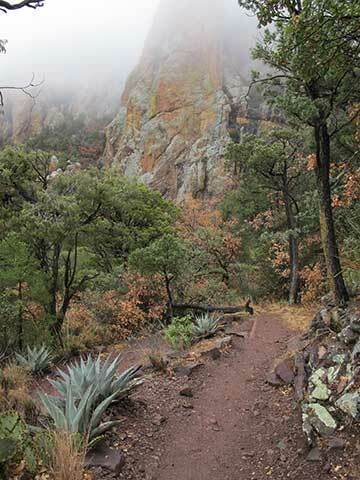 Well, the gods were against us, but despite the forecast of rain (we usually don’t get it even when forecast) we hitched up our packs and hiked up the Pinnacles Trail under overcast skies. My backpack is an old external frame which I carried for 12 days on my solo backpack trip on the 90-mile Wonderland Trail around Mt. Rainier 19 years ago. I carried 55 pounds then. I think I had 45 to 50 on this trip, including cameras and binoculars. My body shape had changed and I couldn’t get the weight of the pack to settle on my hips, where it belonged, so my shoulders weren’t too happy. Ryan is about 20 feet tall, limber, and long-legged, so he was impatient with my slower pace. 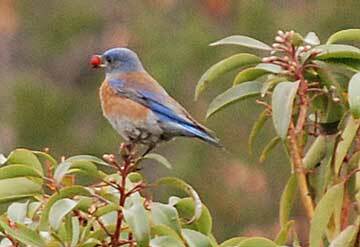 Especially when I stopped to watch birds, such as the western bluebirds eating madrone berries. The Pinnacles trail is considered steep, but it really wasn’t too bad. Especially in comparison to the Wonderland Trail which had a 3500 foot elevation gain and loss in one day. But even in my peak years, I was a slow traveler. We reached Toll Mountain, set up the little tent, fired up the Pocket Rocket stove, and had some good East Indian food with Minute rice, stored the rest of the food and smelly items in the bear box, covered our packs with tarps, and crawled in the tent a little early as the first raindrops fell. Lo and behold Ryan takes a bird picture! 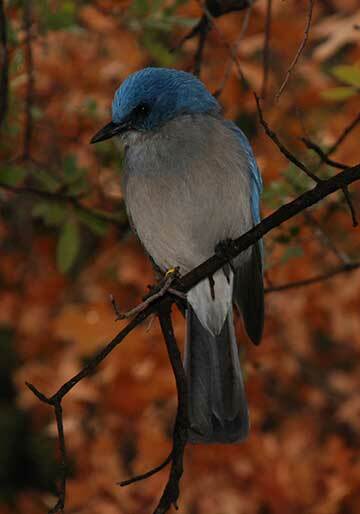 This is a Mexican Jay. And boy did they fall. All freaking night. Wind battered the tent – a “summer” tent with mesh so the wind came through it, although the rain fly kept out the rain. Ryan was nonplussed at my discomfort, since in his opinion one should have an adequately warm sleeping bag and not rely on the tent to keep you warm. Humph! My old sleeping bag obviously wasn’t adequate, and my feet were cold the entire night. Plus I couldn’t go outside periodically to relieve my claustrophobia, since it was raining. So I read “Tuck Everlasting” (one of my required readings for my college course in Children’s Literature) and tried to calm my mind. (I even read it aloud to Ryan). But because I couldn’t sleep and was anxious, my bladder worked overtime. Meaning three trips in the freaking rain and wind, with my headlamp the solitary light within billions of miles. I kept it on in the tent until I could relax enough to fall asleep. But before I could actually enter Lullaby-Land my bones started to ache. I tossed. I turned. My legs kept cramping up. My feet were cold. I felt trapped in a dark cocoon in an endless night. Headlamp on. Headlamp off. Get up and pee. Take off muddy shoes. Pray the tent doesn’t rip to shreds. Toss. Turn. In the 15 hours we were cooped up in the tent, I think I slept an hour in five minute increments. At best. Ryan regaled me with tales of his own horrible backpacking experiences. One night their tent, which was in a poorly maintained depression of a tent site in Mt. Rainier, flooded. He and his girlfriend, and all their gear piled into their friends’ two-person tent, sleeping head to toe like sardines in a tin. Eesh. And once an overweight, poorly attired guy joined them in a shelter on the Wonderland Trail last September huffing and puffing and wet from rain. Ryan thought they might have to effect a backcountry rescue on this guy, but he turned out to have his stuff together more than he looked. There was 2 feet of snow that night and their party was the only one out of several on the trail that decided to continue on. Without the help of another friend skilled in route-finding, they might have been in deep doo-doo traversing Panhandle Gap with no visible trail. 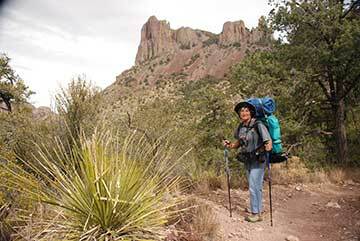 Alas, wilderness travel isn’t Motel 6, but the good experiences tend to outweigh the bad. Not a happy camper. Other photos featuring fingers are not fit for family consumption. 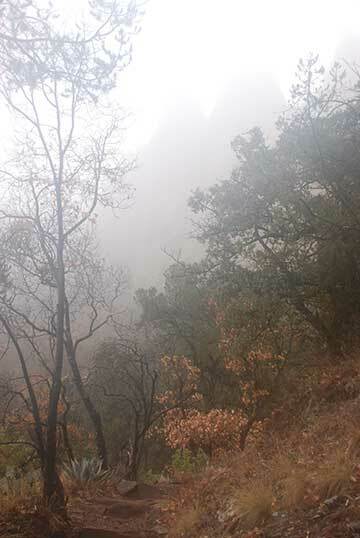 Finally the rain let up and we were enclosed in a muff of mid-morning fog. We packed up our stuff, took some unflattering photos of each other, and decided to cancel the second night. 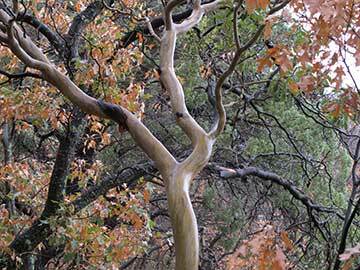 We tromped down the trail, clay-mud sticking to our boots like inch-high heels and splooshing on our pants legs. The Basin below, with its lodge, was visible through a tunnel of fog. 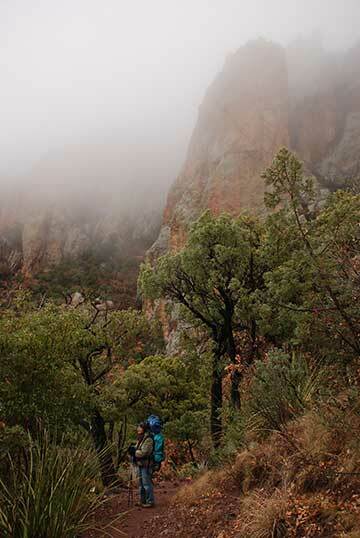 A trail crew boss hiking up the trail to check on his crew in Juniper Canyon confirmed our fears about the weather. We cooked more Indian food and rice for lunch, and put ponchos over us and our packs for the last half hour. We were too filthy to go to the visitor center to return our permit, so I called in our cancellation when we returned. Not that anybody else would be foolish enough to want to camp high in the mountains in such weather. Back at the residence, I moved in a brain fog. At 2 pm a big crack of thunder shook the trailer, rain poured, and then a bright bright rainbow showed itself. I was already in my gown. By 6:30 I was in bed, and if there had been a loud party with dancing on my bed I would not have awoken. I slept the sleep of the dead, and 13 hours later arose refreshed. Ryan told me there had been a terrific thunderstorm during the night. We would have been lightning bait had we continued our trip. The following week, when my brother Alan joined us, I had planned a canoe trip with the River Rangers, but the forecast of rain and sleet, and the memory of The Worst Night of My Life, led to us bailing out. We went to Hot Springs instead and soaked in the 105 degree pool, (in the 40s, no rain) and had a stimulating conversation with some retired folks from northern Maine who spend winters traveling the Southwest with their Toyota Rav 4 and a small Scamp trailer. Now that’s my kind of camping. Two days later Ryan spent 2 solo nights on SW 4, traveling at his own speed, enjoying the solitude and beauty. He got snarled at by a mountain lion in the shrubs which he didn’t see. He was between the lion and a herd of deer, so it was probably ticked at the interference in its hunting. He picked up some rocks and kept a lookout, but never saw the critter. I’m glad he got to experience the High Chisos in all its glory. At least I got to finish “Tuck Everlasting.” Twice.